The closer a red dwarf is to the plane of our Galaxy, the more likely it is to sport magnetic activity such as spots and flares, say astronomers in the United States. Furthermore, the activity persists for the first 6 to 7 billion years of the star's life, then rapidly declines, at least for those red dwarfs with spectral type M7. Red dwarfs are the most common stars in the Milky Way, accounting for three fourths of its stellar population. Like the Sun, red dwarfs generate energy by converting hydrogen into helium at their centers; however, the stars have less mass--between 8 and 60 percent of the solar value--so they are smaller, fainter, and cooler than the Sun. Andrew West of the University of California at Berkeley and his colleagues examined 2,601 red dwarfs that they culled primarily from the Sloan Digital Sky Survey, which is mapping one quarter of the sky. Most of the stars have the same spectral type--M7--so each star emits approximately the same amount of light into space. This makes it easy to estimate a star's distance: the fainter an M7 dwarf looks, the farther it must be from Earth. Even by red-dwarf standards, these stars have little mass. 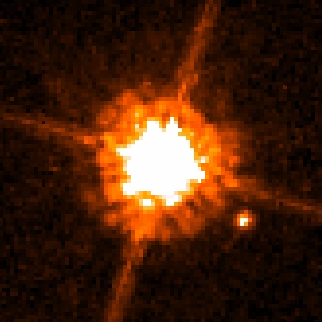 A typical M7 dwarf is only a tenth as massive as the Sun. The nearest M7 dwarf is Teegarden's Star, located 12.5 light-years from Earth in the constellation Aries. West and his colleagues divided the M7 dwarfs into two groups, active and inactive. The active stars, designated M7e, have a hydrogen emission line at a red wavelength of 6,563 Angstroms; the inactive stars, designated simply M7, do not. Teegarden's Star is an inactive star. Altogether, the astronomers classified 70 percent of the stars as active. Such stars have strong magnetic fields that cause flares, spots, and emission lines. The astronomers then computed each star's distance above or below the Galactic plane. To do so, they assumed the Sun is located 88 light-years north of this plane. The astronomers found a striking correlation: 88 percent of the M7 dwarfs nearest the Galactic plane are active, whereas this figure drops to less than 50 percent for the stars farthest from the plane. Two years ago, the same astronomers reported a similar finding, but their sample size was so small that the correlation could have been spurious. West and his colleagues say this correlation arises because, like some people, M7 dwarfs become less active as they age. Red dwarfs are born near the Galactic plane, but as they orbit the Galaxy, they encounter giant molecular clouds whose gravity tosses them to and fro, scattering them to greater distances from the Galactic plane. Thus, stars at greater distances from the Galactic plane tend to be older than those closer to this plane. As this work shows, those same stars also tend to be less active. Dermott Mullan, a red-dwarf expert at the University of Delaware, is impressed with the work West and his colleagues have done. "It's a very large and homogeneous sample," he says. "The fact that they have been able to identify as many as 2,600 of these objects--all with spectral types around M7--is a phenomenal achievement." Mullan says magnetic activity may decline because a red dwarf spins more slowly as it ages, sapping its magnetic field. Or the star's internal structure may change, possibly in response to a declining magnetic field; this stuctural change further weakens the magnetic field. In the 1950s, other astronomers discovered that magnetically active red dwarfs tend to cross the Galactic plane more slowly than do their inactive peers. This result implied just what West's team has found: that active red dwarfs should remain close to the Galactic plane, because they lack the vertical speeds needed to carry them to great heights. By simulating the Galaxy on a computer, West and his colleagues were even able to deduce the timescale for the magnetic activity to decline. They find that after 6 to 7 billion years, M7 dwarfs experience a rapid decrease in their activity. For comparison, the Sun is 4.6 billion years old, and the universe is about 14 billion years old. The astronomers plan to extend their work to red dwarfs with spectral types other than M7. Red dwarfs of different spectral types have different masses and therefore their activity may decline at different rates. West and his colleagues will publish their work in The Astronomical Journal. Ken Croswell is an astronomer and the author of Magnificent Universe and The Alchemy of the Heavens, whose eighth chapter describes how Lyman Spitzer and Martin Schwarzschild first came up with the idea that giant molecular clouds scatter stars to greater distances from the Galactic plane. "An engaging account of the continuing discovery of our Galaxy...wonderful." --Owen Gingerich, New York Times Book Review. See all reviews of The Alchemy of the Heavens here.